Today i am going to write about the costume of the region of Kapsai, somewhat of a sister region to Zanavykia. Kapsai is south of Zanavykia, between Lithuania Minor and Dzukija, bordering on Poland to the south. 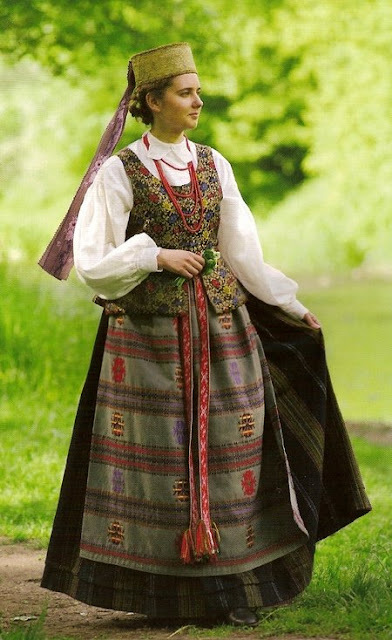 This corner of Poland historically had a sizeable Lithuanian community, and actually i am not familiar with any Polish costume native to this corner of Poland. Here is a map showing the Kapsai region. This map shows Dzukia extending to the south of Kapsai. Different maps do not agree as to the exact extent of the various regions, Dzukia in particular. 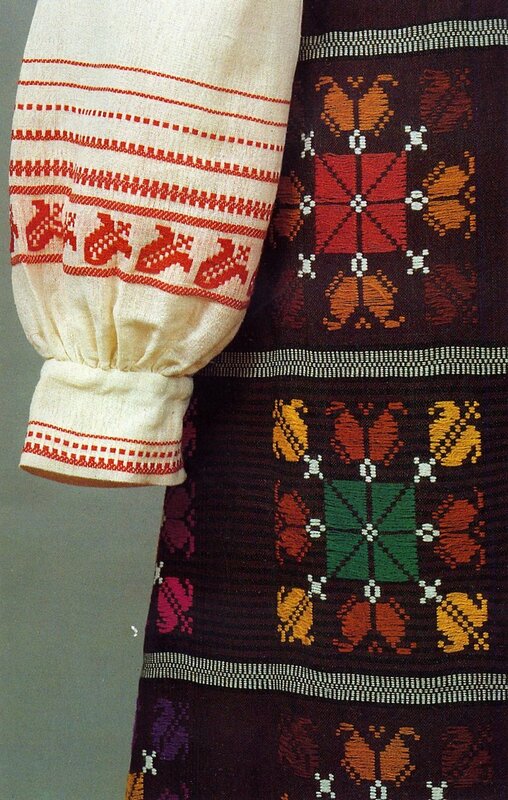 Kapsai has perhaps the most colorful and impressive costume of LIthuania. Sometimes artists mix pieces from different regions in their drawings. 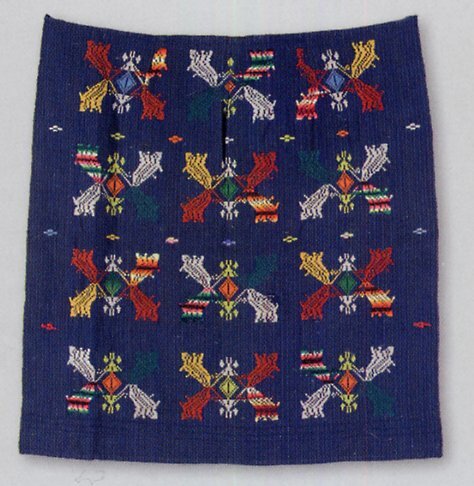 When this is the case, they almost always depict an apron from the region of Kapsai. 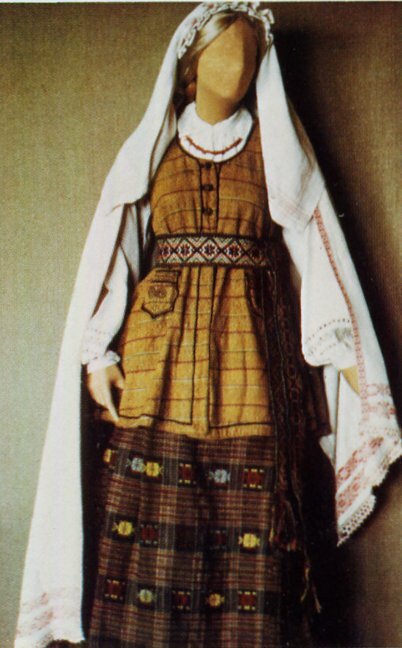 Here is the most prominant of the Lithuanian costumes on display in a museum in Moscow. 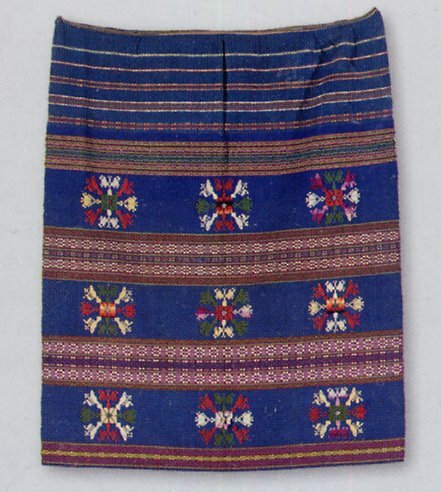 A good representation of the Kapsai costume. 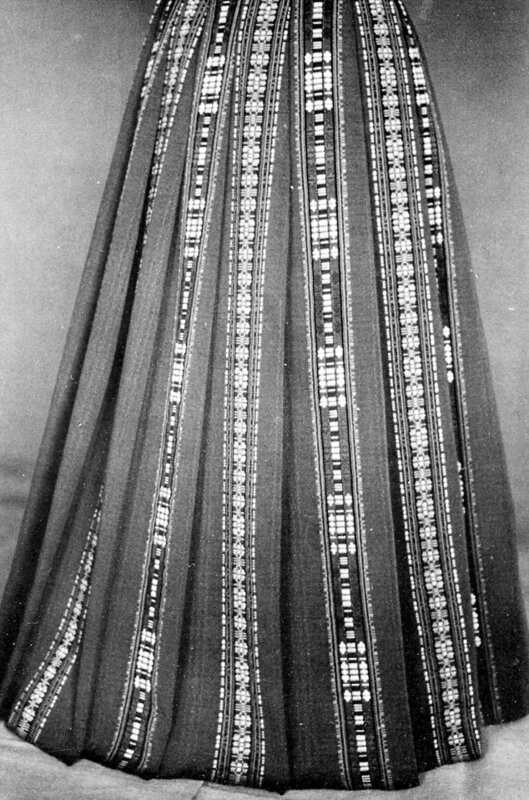 Here are a couple of prints from V. Palaima representing the Kapsai costume. 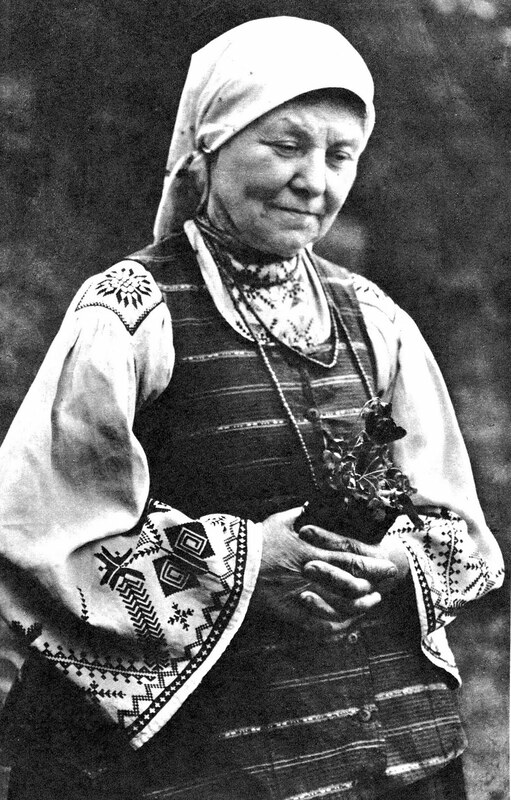 A couple of images from Jurkuviene. An example from Glemžaitė front and rear. And a couple of photos from Tamošaitis. 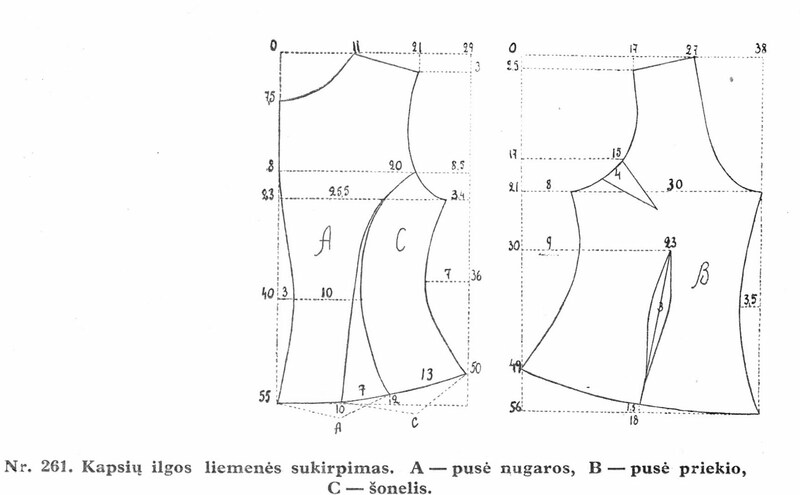 The most evident differences between this and the Zanavykian costume is that the bodice has a different cut, generally being much longer, and the apron has horizontal ornament. 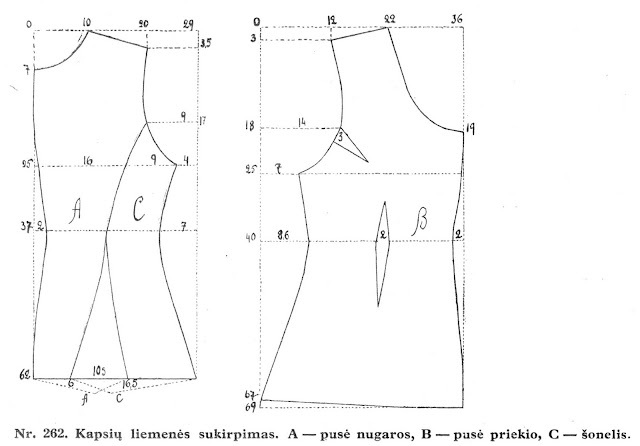 Starting with the chemise, It has the usual Lithanian cut, tunic type with narrow shoulder tabs. 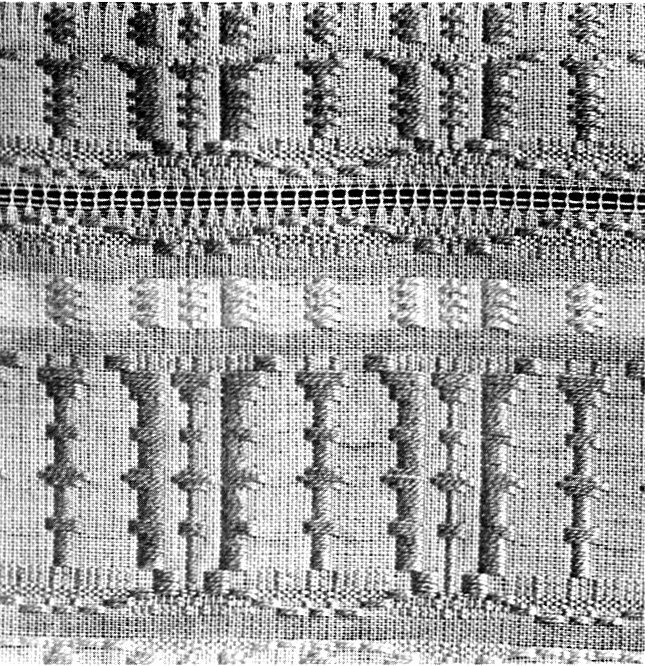 It was ornamented with overshot weaving, hemstitching, broderie anglaise [which was exceptionally popular in this region] or other embroidery. The embroidered chemises tend to have shoulder pieces which have been widened. Here is a closeup of the costume from the Russian museum. Overshot weaving in white and ecru on a lower sleeve. 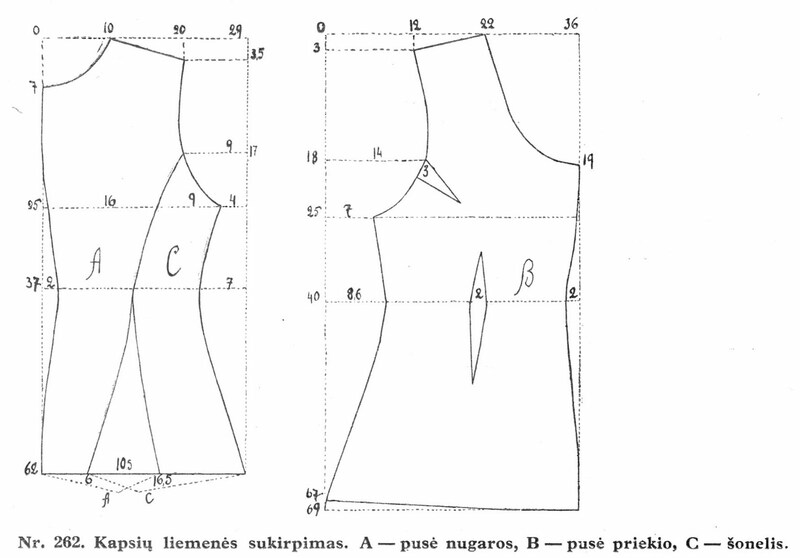 Hemstitching on lower sleeve and shoulder piece. 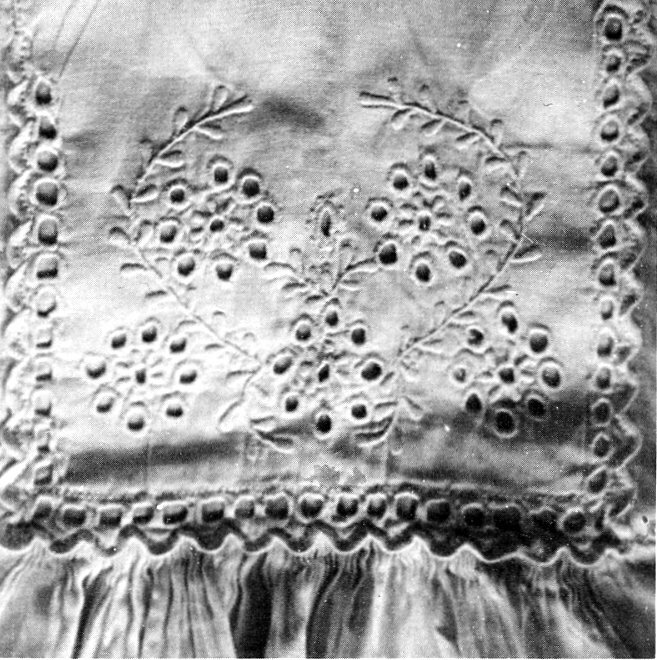 Broderie Anglaise on a shoulder piece. Cross stitch on a chemise. 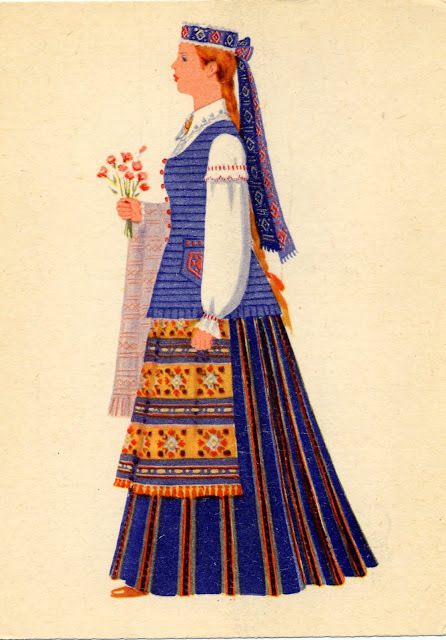 You will notice that the upper sleeve is gathered into the shoulder as in Zanavykia, and the tulip and rue plant are major motifs. 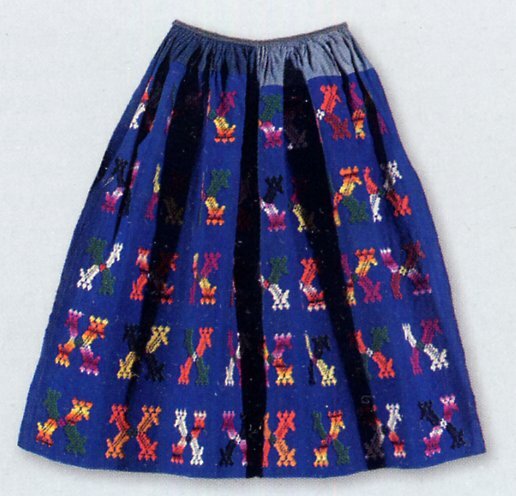 The skirt is most commonly woven with vertical stripes on a dark background, as in Zanavykia, sometimes solid stipes, and sometimes the stripes have ornamental motifs woven in.But plaid and solid color skirts, perhaps with spot motifs woven in, are more common than in Zanayvkia as a result of influence from neighboring Dzukija. 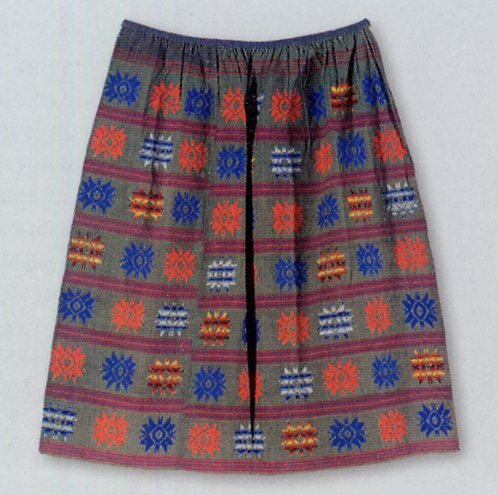 Again, as in Zanavykia, the apron takes center stage. Peruse the images in the posting. Horizontal arrangement is distinctive for this region. 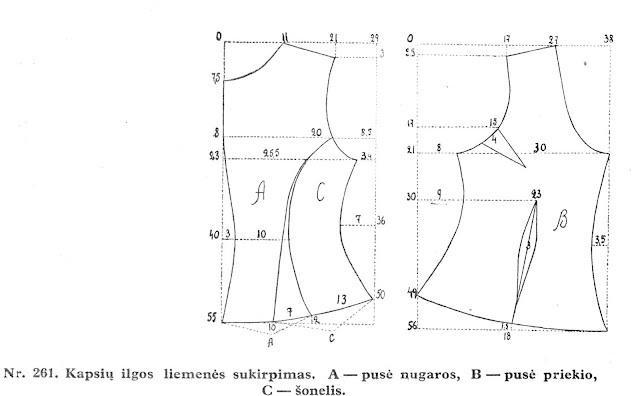 Sometimes the upper part is left unornamented or made from a cheaper material, because the bodice covers it. 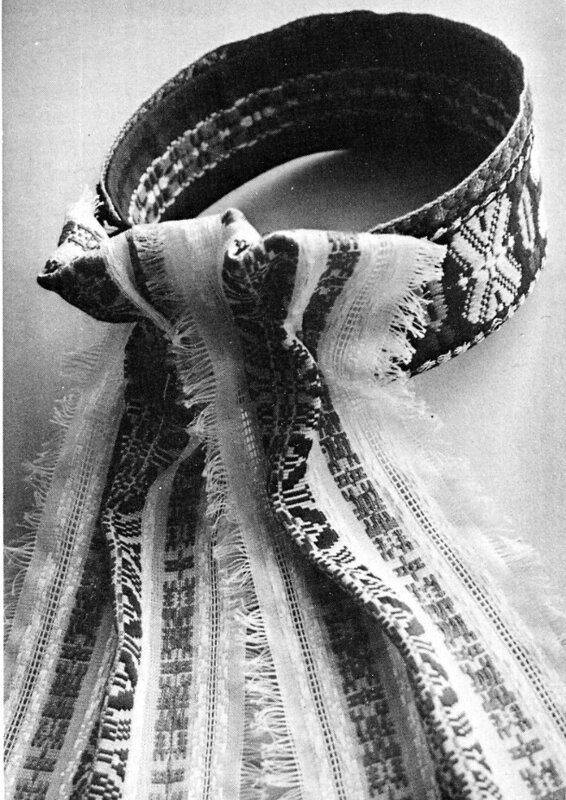 The sash is wide, with very ornamental motifs, it is tied either under or over the bodice. 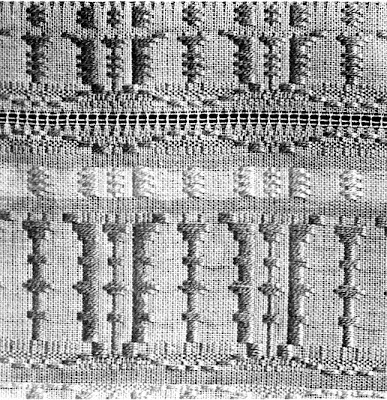 Tulip motifs are often prominant, and the supplemental weft fringes are well in evidence. 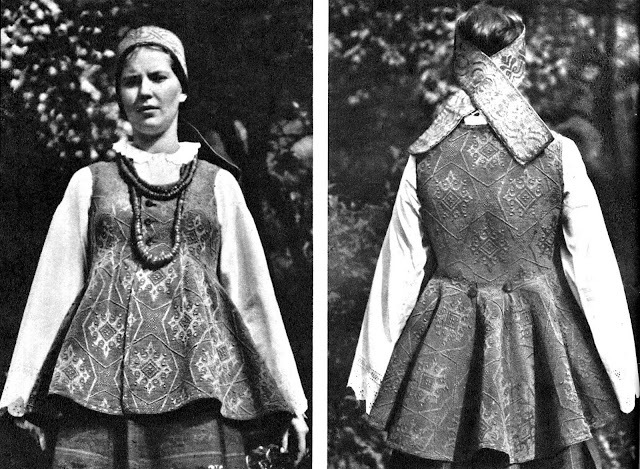 The bodice varies somewhat, but tends to be longer than anywhere else in Lithuania, resembling the kersetka of eastern Ukraine. 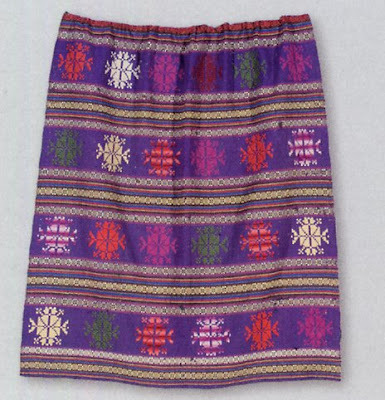 It is made either of home woven or bought material. Some examples flare more widely. Here is a back view of one example, and two different patterns. 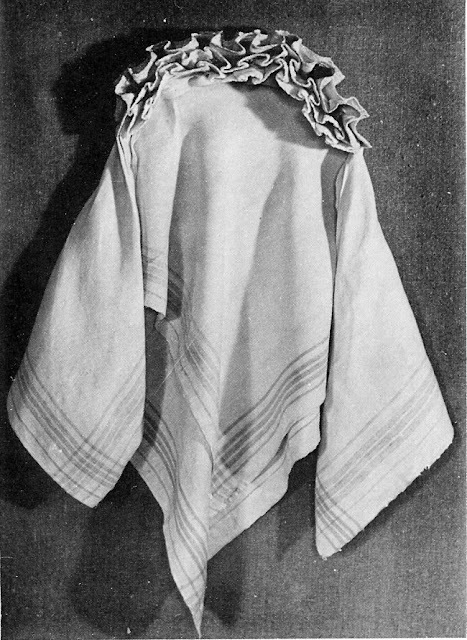 The headpieces greatly resemble those of Zanavykia, kerchiefs with or without front pieces, galloons, netted caps with front pieces. 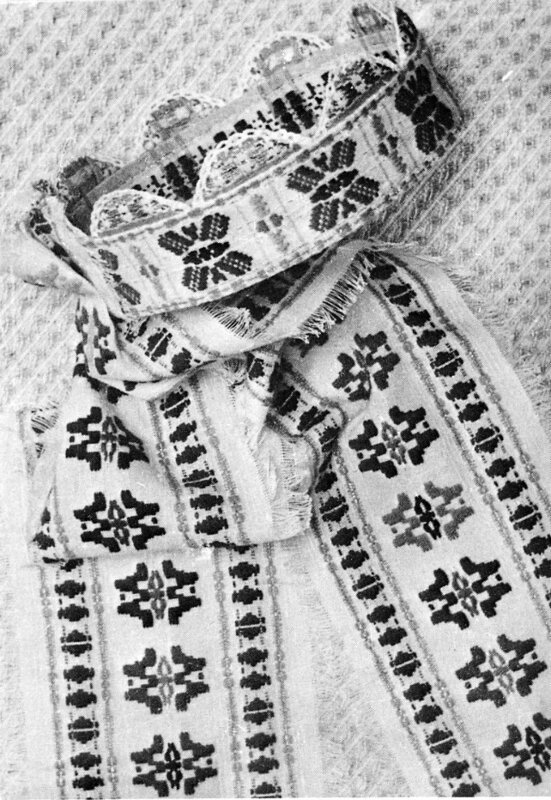 The beaded headbands are apparantly not found in Kapsai. Here is an image of a somewhat different type of karuna found in Kapsai. This is a headress called pakalke, similar to the karuna, but without points and higher. A linen kerchief with woven ornament and attached frontpiece. Necklaces of amber, coral or glass beads complete the costume. Thank you for reading, i hope you have found this interesting and possibly inspiring. Jurkuviene treats this costume together with the one from Zanavykia in her article.on Suvalkija. Very exciting to find your blog. 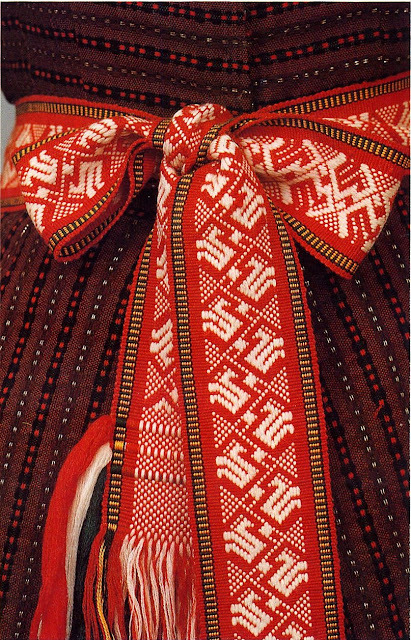 Thank you for all the information and photographs - your research is really helping me differentiate the folk costumes of Lithuania by region. I was taught that Lithuania is divided into 5 regions; Suvalkija is the name of the region that encompasses Zanavykia and Kapsai as sub regions. I havent seen this mentioned in your blog so far and - the map at the top of the post is organized differently. Anyways, thank you again for the rich information. 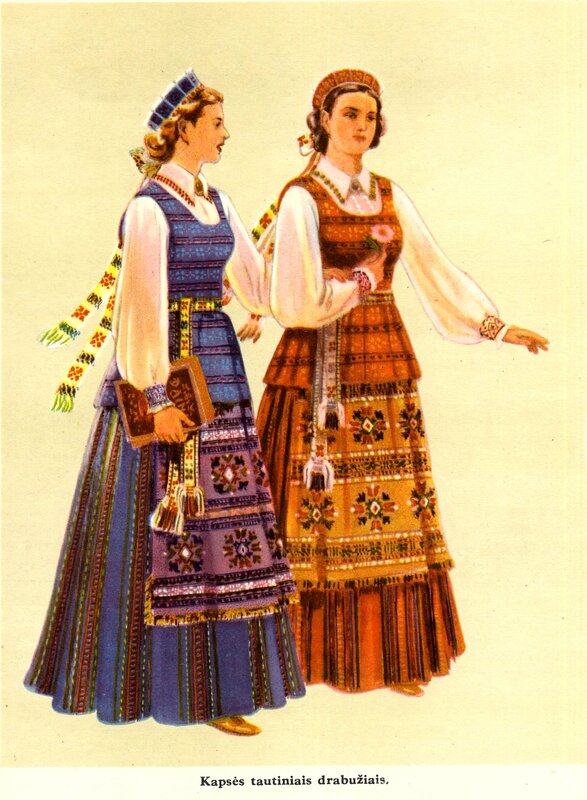 Yes, I believe I mentioned that in the first of my articles on Lithuania. 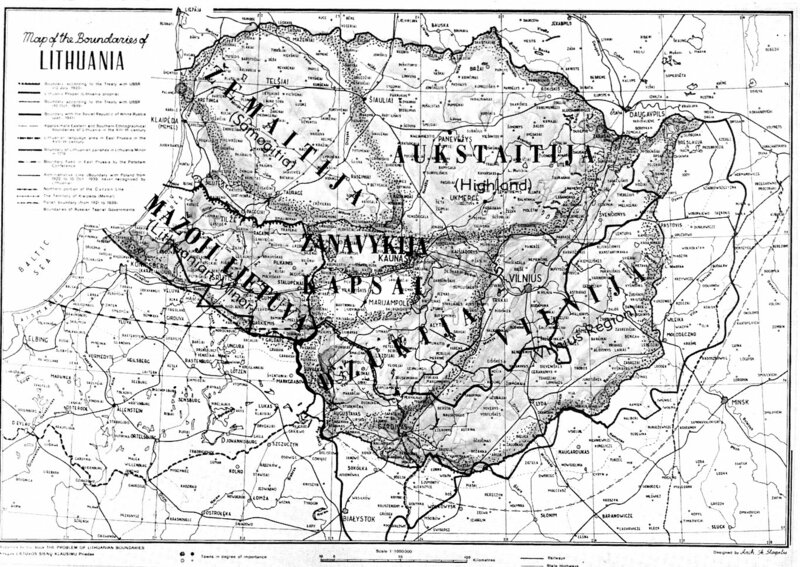 Some sources describe Zanavykia and Kapsai as sub-regions of Suvalkija, named after the city of Suwalkia which is now in Poland. These same sources also often do not recognize the region of Vilnius. The region of Dzukija especially is differently drawn on different maps. I admit that I have a preference for more regions over fewer. It also depends on which criteria you use, historical provinces, dialects, etc. 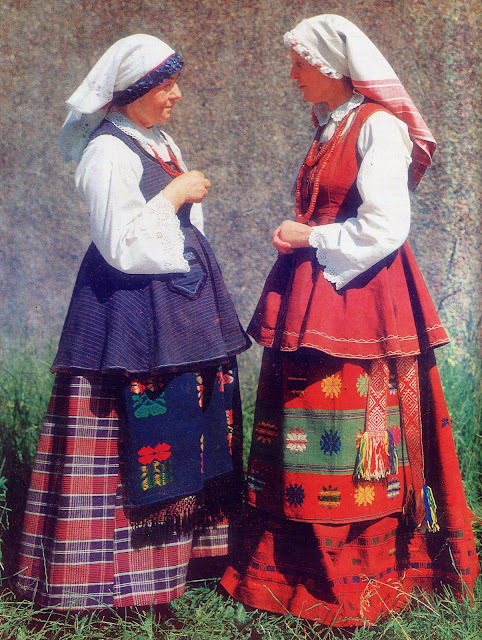 Folk costumes, as a rule, are very local. Thank you for your kind words.